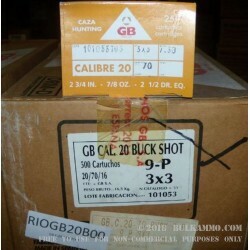 500 rounds of 20 gauge buckshot loaded with 2 ¾” shells made by Spanish producer GB ammo that is part of the conglomerate MAXAM who has a ton of subsidiary companies that produce ammunition. They are among the largest producers of munitions in the world and have such notable names as Eley, Dynamit Nobel, RIO and many others as part of the munitions division. GB is a well-known brand that has been producing shotshells and sporting rounds in Spain since the mid 1920’s. They have since expanded into more than 30 markets worldwide. Their reach is massive and it’s about time that the shotshells they produce have made it into the United States. MAXAM is a large diversified company that has a ton of holdings in the munitions markets. Their scope and production ability are massive. 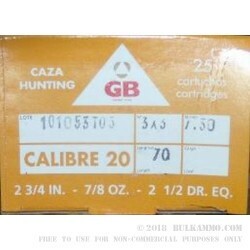 GB is a key part to their success, and this ammunition is a very good quality, reliable sporting round, suitable for large game hunting with a 20 gauge. The 9 pellet 7/8 ounce shot cup holds the very effective 00 Buck shot in the 2 ¾” shell. This is a potent offering for the 20 gauge.